For single music lovers everywhere, there's now even less of a need to talk to a girl (or a guy) wearing headphones. 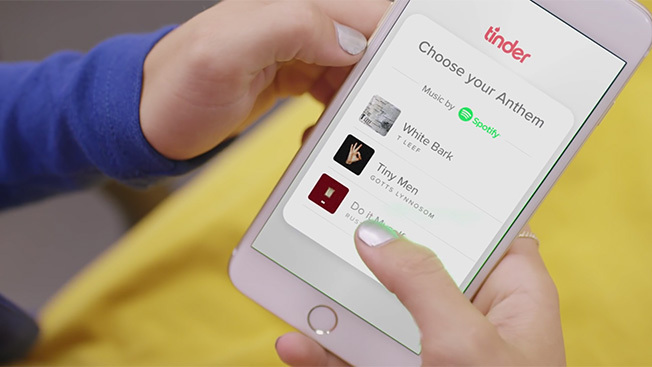 Spotify is teaming up with Tinder to integrate the music-streaming service into the single-swiping service as a way for users to showcase their music preferences in their dating profile. The music/dating match, announced today, allows users to include a "personal anthem" that shows each person's top artists. In a blog post Spotify said the feature could be a way to "make a little music with someone new." "It's that one single track that tells your story. That one song you can't get out of your head," according to Spotify. "Where the lyrics of your life meet the rhythm of your soul. It may change as you change, but at any given time, you have an anthem—and the world is waiting to hear it." It's not the first time Spotify has tried its hand at musical match-making. For Valentine's Day, it matched agency staffers in cities around the world based on an analysis of music preferences. Here's a video explaining how musical Tindering will work.